He was still the best pitcher on the team by a country mile. Look, I'm sick and tired of the whole 'we are going to rebuild' crap. As a fan, it feels like the team is on a perpetual escalator and the playoffs at the top... they almost make it only to fall down on the up escalator. Only way this could get worst is if Cano and Cruz leave town. Phillies either had or were super close to a deal for Paul Goldschmidt, but it fell apart when at the last minute they were like "oooooh, yeah, we almost forgot... we're going to need you to take Carlos Santana too" and Arizona didn't want him or his salary. The trade doesn't make sense to me because part of their off season plan is to move Rhys Hoskins back to 1st base, and either trade, release, or move Carlos Santana to 3rd. Getting a guy that can only play 1st seems to be counterproductive. Not when the first baseman you’re getting is as good as Paul Goldschmidt. That guy is MVP caliber just about every season and is only overlooked because of the market he plays in. He’s sort of the west coast version of Joey Votto, but with quite a bit more power. Agreed. He’s a top-notch guy when he isn’t hurt. He could put the Phillies over the top. MLB may announce a gaming partner tomorrow. Could a third deal be on deck for MGM? how often is he hurt? Not use for guys that are always injured. In 2014, he broke his hand and only played in 104 games. Since then, he's played in 159, 158, 155 and 158 games. Oh, so he calls out sick 3 or 4 times a year? Don't want him. Sarcasm aside, yeah you do. I thought absolutely nothing of the guy until I spent a full season watching him live. He’s one of the best players I’ve ever seen play. He’s injected an insane amount of firepower into so many lackluster D Backs lineups that had no business being as productive as they were. And a lot of that has to do with the protection he provides. He also comes with basically zero drama (he’s similar to Buster Posey in that he’s PAINFULLY boring because he literally cares about nothing but baseball) and is a devout Christian so you won’t ever have to worry about him doing some scumbag :censored:. I know I’m stanning weirdly hard for Goldy right now, but I genuinely think that much of him. I think the D Backs are morons for not moving heaven and earth to lock him up long term. He’s the absolute definition of a franchise player. In a sport where money doesn’t matter, and for a team that’s said that money isn’t a concern, I’m surprised they don’t go for him and worry about Santana later. It’s only money. I do think they think Rhys Hoskins can be a franchise player and probably needs to play 1st in order to reach his potential because maybe he’s worrying too much being in the outfield since he’s below average, but then tough. Figure it out. They’re talking potentially “stupid money” for this guy. He good? After the A's stadium plan at Laney College site failed, today, they've announced their latest plan for a stadium at the Port of Oakland's Howard Terminal. 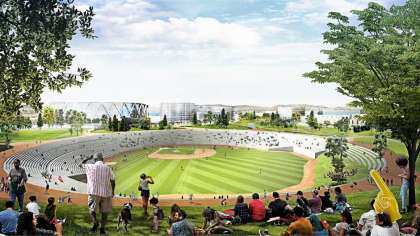 The first two renderings are for the new stadium itself and the third image is a redeveloped Oakland Coliseum. That green roof is really cool. Yeah, that's a cool concept. If they're going to pay their own way, I'd love to see it get built. 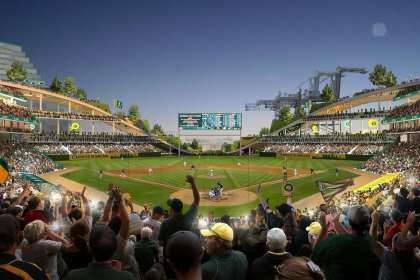 But if you're going to redevelop the Oakland Coliseum into a community baseball field, why would you do that much work only to leave the colossal foul ground? I don’t know of a single sports fan that doesn’t think at some point they can do better than management. It's a nice fantasy. Hence the name fantasy sports. I have to do provide an answer to this question to one organization for real. I had to break the news to my wife that we may have to move on short notic﻿e to a city she ﻿has ﻿never been to. That kind of real. I stopped posting on this board so I could devote more time to getting to this point with no guarantee it would ever happen. Now it’s up to me. I'm super late on this, but wanted to say congratulations. That's really exciting! It’s part of the charm! 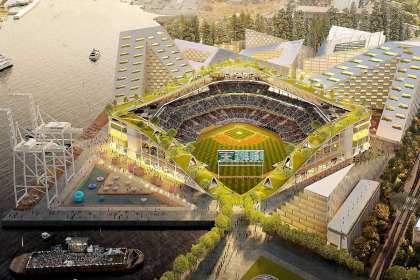 It’s a fantastic concept for a Port of Oakland stadium and I’d be glad to see a privately-financed version of it in reality. For Marshawn Lynch and his kickball games.